Curiosity Table Activity Station is rated 4.8 out of 5 by 22. Draw out your child's naturally curious spirit with Baby Einstein's Curiosity Table. 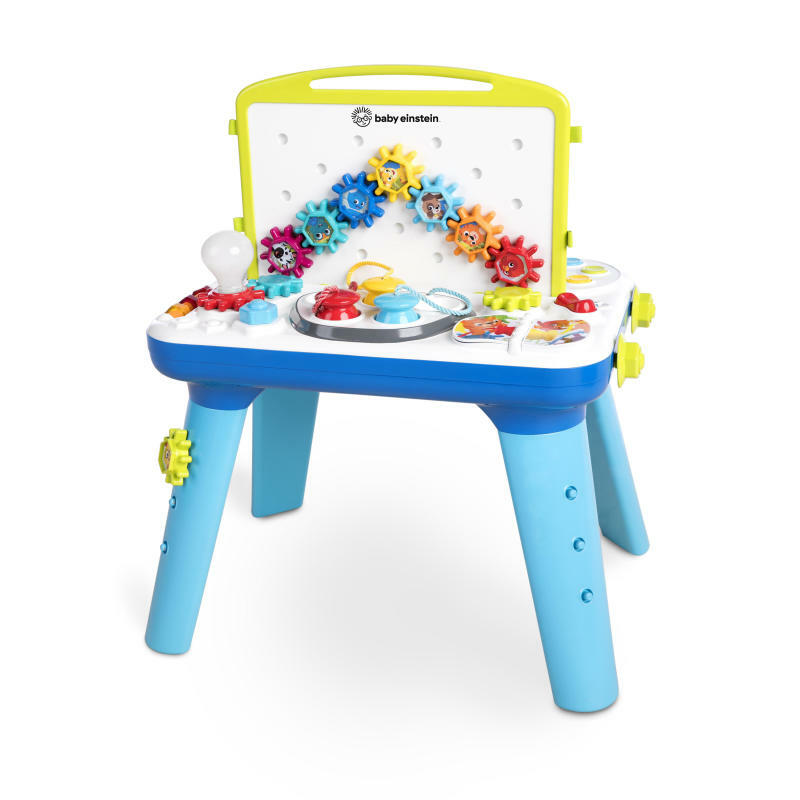 From removable, spinning gears to color-discovery circuits and flashing lights, the two-sided art and science table will capture your little one's attention for hours. Watch as the gears connect to make the light bulb turn on! Experiment with color using the mess-free ""paint pots."" Your little one will love investigating all the gadgets on this double sided table. It plays more than 65 melodies and introduces vocabulary in English, Spanish or French. Volume adjusts to either high or low settings, or can be turned off completely. When the sounds are turned on, you and your baby will enjoy a better musical experience from the higher end quality speaker. Whether he's stepping or crawling, the activity station grows with baby. The middle art panel is removable to make more space for baby's arts and crafts - it even attaches to the end of the table. And removable table legs make it easy to convert the table for floor play. A drawing art surface and a dry erase whiteboard leave plenty of room for big brother or sister to join in on the fun too. Pull up a seat - this play station is fun for parents too! Dimension (in) 23.5" x 17.5" x 27.6"
Rated 5 out of 5 by Anniem0130 from Hours of entertainment Our boys love this product! So many thinks you can do with it! They love all the moving gears and making the light turn on. I love that gear board can move from the middle to side to divide the playing area or let them play together! So much fun! Rated 5 out of 5 by August from Love it! Kids really love all the sounds and lights. The board in the middle seems A bit flimsy but the kids love how twists and spends on it . The purple writer would be nice if it was attached some how. We have had to search for it a couple times as it has walked away with a child. Rated 4 out of 5 by Bree from Cool feature The Baby Einstein table definitely keeps children exploring their curiousities! It keep my two youngest busy for hours. Everything from the two sided table to the spinning gears were placed in the right spots. My children definitely had fun playing with this toy. Rated 4 out of 5 by Danyellxo from Fun for everyone! This toy is a hit at my house! The kids fight over making different patterns with the wheels, writing on the white board and playing different tunes. I have already reccomended it to several friends. The different languages is a neat feature. My older kiddos are starting to pick up some Spanish now. The only thing that would have made this perfect is of it had came with a white board pen and a pen for the scribble area. The kiddos don't miss them though. This will be played with for quite some time. Rated 5 out of 5 by Rebekah from This is the perfect activity table! This was perfect even more my 8mo old! He loves the different sounds and I love the exposure to other languages! Rated 5 out of 5 by Ronnie from Great activity table My son loves this! He is learning how to stand and it holds up his weight and gives him something to hold his attention. The activity station has lots of things for him to grab onto and helps him work on his hand-eye coordination! Rated 5 out of 5 by bvickrey from Tons of Fun The Baby Einstein Curiosity Table Activity Station is hours of fun in one activity center. Watching my grandson play with each activity and his face light up as the light bulb came on was priceless. Drawing on the dry erase board was favorite that lasted for hours. I really like that I could take the legs of for when my younger granddaughter came over and she play on the floor and the different activities. Having toys that all the grand-babies of different ages can enjoy is very important to me and this one fit that need. I would and have recommend the Baby Einstein Curiosity Table Activity Station to Parents and especially grandparents.